An original primitive art style native design on a wood backing with frame and glass. 12 X 16. Shipping Free. 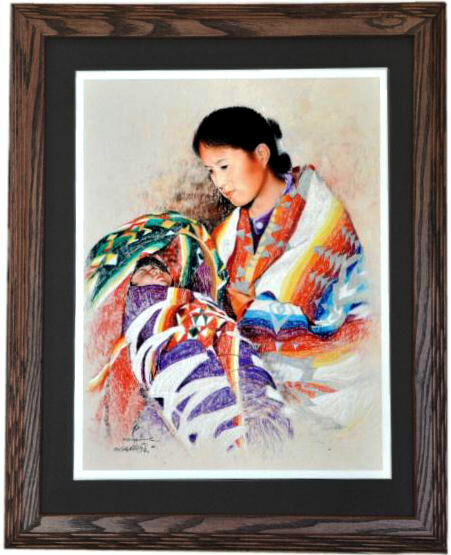 This is a signed, limited edition by the famous Hopi artist Neil David Sr. It is of three Tewa/Koshare Clowns eating watermelon, called "Hopi-Tu Tsootsvolla." Matted and wood framed, it is 18" X 14". Shipping is Free. This is a Lithograph of the Famous Eagle Dancer by legendary Stephen Mopope of the Kiowa Six, a group of the early 1900's Native American painters, who created a new style portraying Kiowa Indian social scenes and ceremonies. This Lithograph is framed in red cedar with matting and has unbreakable, non-reflective, high quality styrene instead of glass. 20" x 16". Shipping is Free. �Guardian of Spider Rock� by Native American Navajo Mark Silversmith. This is a second version of Spider Rock in a beautiful, gallery printed and matted special edition produced personally by Mark Silversmith. 13 inches x 27 inches. Framed in step oak walnut wood and matted. Shipping is Free.